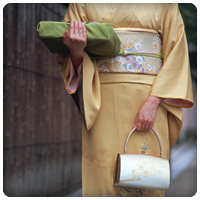 I was reluctant to wear kimono since the constrained experience I had wearing a long sleeved kimono. I have decided to learn how to wear kimono because my grandmother had many kimonos and thought it would be a waste not to wear them. I thought I would only learn fix up in just ‘five lessons’, but the lessons consisted of posture and history of kimono, tying obi, special tricks and tips for smart kimono shopping which made me become expert on kimono. I now wear kimono by myself casually. It has always been a little bit stressful going overseas business trips as I am not good at English. It is very important to understand my own culture in order to do business deals abroad. 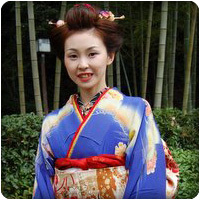 Having listened to Ms. Tsuda’s talk in Rotary Club, I got interested in kimono and I asked her for kimono lessons. I practiced tying kaku obi by tying it to a leg of a desk and then brought it to the overseas business trip. I got a lot of attention at party and recognized kimono as a communication tool. But I attended kimono coordinating class because previously the color matching of kimono was dull and I wanted have my own color matching. 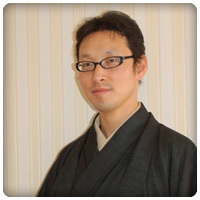 Using my kimono and obi, Kazumi sensei taught me My friends praise my dignified Edo-style color matching kimono. I had been interested in the Japanese culture and was completely blown away by the beauty of kimonos when I first saw them in Japan. I was very pleased that kimono private lessons, where we learn how to wear it for ourselves,were taught in English and that my questions about the Japanese culture werealso clearly answered. 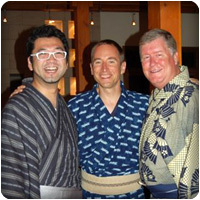 After my successful completion of the course, I had my own kimonos tailored and show up for a party in kimono, which evokes admiration from Japanese friends. It is small sized class so the lessons have some flexibility to choose the time and content. Time passes quickly listening to sense’s very interesting talk. 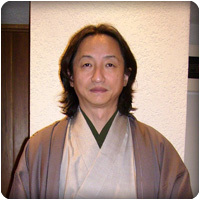 The lessons gave me a different perspective of kimono. I was invited to my friend’s wedding and I wanted to attend the wedding wearing montsuki haori hakama. I asked for kimono lessons and Ms. Tsuda quickly prepared everything I need for me. I have managed to wear kimono by myself for the wedding reception. There is nothing like Ms. Tsuda’s attentive instructions in other kimono classes. I decided to take lessons because I wanted my boyfriend to wear a kimono. The lesson time is flexible so I can take lessons even in a busy schedule. The scales fell from my eyes on tips to wear kimonos beautifully. My friend asked me to take kimono lessons with her and I thought it would be great to be able to wear kimono for the New Year. The first lesson was to ‘know myself’. I believe the instructions were rational because the curriculum was matched to my ability, personality and purpose. Although I had a biased view of kimono as difficult to wear, I now help my friends with putting their kimonos on. © 2000 - Kazumi流 All Rights Reserved.